Green Roof Design | While the practice of building green roofs is centuries old, it has experienced a renaissance as the structural philosophy of the future. A living green roof reduces the costs of heating and cooling, encourages the local wildlife and naturally filters the rain water it receives. Here, we celebrate the work of some of today’s most talented, most progressive architects, who have adopted green roof design techniques to yield beautiful, sustainable works of architecture. The green roof design of Villa Bio stands out amongst a community of cookie-cutter, Mediterranean-style homes in Llers, Spain. While it was first met with controversy, the completed Villa Bio reflects the nature of the local landscape much more intimately than its neighbors. That nature does not end at the corner of its plot, but continues on to the home’s hydroponic garden that snakes along its green roof. Architect Enric Ruiz-Geli has masterfully designed a home with a seamless connection with the Mediterranean environment, an organically-inspired structure with a lush, productive green roof. This terraced, multi-family home in Mill Valley, California is as hilly and green as the environment around it. The Mill Valley Residence by McGlashan Architecture includes three sections, each with its own green roof, built into the hill of the lot. 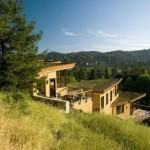 The green roof design of the Mill Valley Residence may not produce vegetation of the garden variety, but plants that hail from the home’s local flora. The result is a stunning home with a green roof that reduces heating and cooling costs and stimulates the habitat of local Mill Valley wildlife. The Nanyang Technological University of Singapore recently erected a green roof building to house their School of Art, Design and Media. The five story structure features two curved sections with stretches of green roof fully accessible to students. 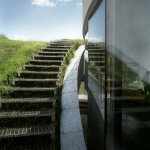 In the Nanyang School of Art, the line between landscape and building are blurred. 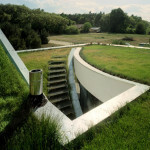 Beyond the aesthetic value of this green roof design, this living skin saves heating and cooling costs and collects rainwater for landscape irrigation. 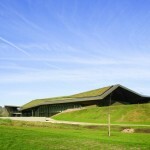 It is no coincidence that one of TheCoolist’s favorite works of architecture features a green roof as its crown. The Paraty House by Marcio Kogan Architects is a sprawling tropical retreat, fully immersed in the vibrant nature of island life. Once its occupants arrive by boat, taking frequent trips back for groceries isn’t on the menu. 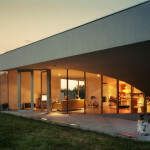 Instead, its inhabitants tend to a large, well-stocked vegetable garden over its top floor. This green roof provides the herbs and veggies needed to compliment the freshly caught seafood just steps away from Paraty House’s magnificent deck. 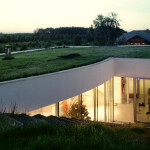 The benefits of green roof design and other green technologies are not always apparent. To help communicate their values to the public, the Green Technology Showroom by Vector Architects is an example in eco success. The Green Technology Showroom in Beijing, China is blanketed in thick, climate-controlling grasses attached to an inner steel skeleton. It now stands in a residential development, a temporary symbol of sustainable design. The California Academy of Sciences by Renzo Piano is a stunning achievement in green roof design. Such structures are no stranger to Italian architect Renzo Piano, who designed a long time favorite of TheCoolist, the Vulcano Buono in Nola, Italy. The CAS building in San Francisco, California features a 2.5 acre green roof that is blanketed by local plants, acting as a habitat for bay area wildlife. Within, the CAS features a planetarium, an aquarium and a man-made rain forest, all three of which rest right under the dome sections of this amazing green roof. The harsh coastal winds of Santander, Spain can make enjoying this rocky shore quite difficult. Where most houses in this stretch focus back inland, the OS House by NOLASTER Architects is centered around the water below. It is built in a low-profile fashion that merges with the plot’s topography, as well as continuing the foliage around it with a full-size green roof. 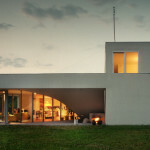 Unlike many others on this list, the green roof design of OS House is habitable, a soft, grassy bed on which to enjoy the coastal nature of Spain’s north shore. When it comes to blending in with the landscape, few buildings are a greater success than Historial de la Vendée by PLAN01 Architects. PLAN01 has created a geometric, softly-pitched structure lined with a lush green roof. From a distance, this green roof looks nearly indistinguishable from the land around it, just a collection of hills in a field in France. 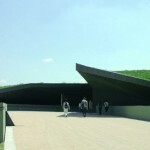 A closer inspection reveals a truly stunning building, one of the most visually natural green roof designs today. 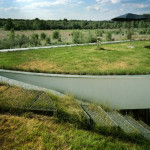 The plot for this amazing green roof home called for a rather specific characteristic– a field clearing within a forest. 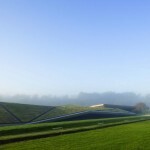 The OUTrial House by KWK Promes appears to have been excavated right out of the rolling Polish countryside, then covered over with the very grass it broke to be constructed. The smooth curves and shaggy grass roof give this home a dreamy appeal, as if it were inspired only by childhood wonder and imagination. Thanks for reading, and feel free to share your thoughts on green roofs, sustainable architecture and progressive design principles in the comments below. In the mean time, be sure to check out these other great architecture-related features here on TheCoolist.